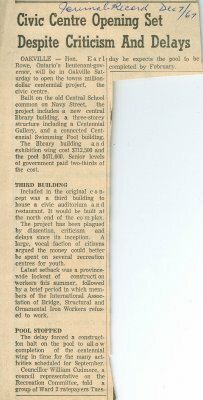 A newspaper clipping from the Daily Journal-Record of a column detailing the issues that were faced while constructing the Oakville Centennial Centre. OAKVILLE - Hon. Earl Rowe, Ontario's lieutenant-governor, will be in Oakville Saturday to open the towns million dollar centennial project, the civic centre. Built on the old Central School common on Navy Street, the project includes a new central library building, a three-storey structure including a Centennial Gallery, and a connected Centennial Swimming Pool building. The library building and exhibition wing cost $712,500 and the pool $471,000. Senior levels of government paid two-thirds of the cost. Included in the original concept was a third building to house a civic auditorium and restaurant. It would be built at the north end of the complex. The project has been plagued by dissention, criticism and delays since its inception. A large, vocal faction of citizens argued the money could better be spent on several recreation centres for youth. Latest setback was a province wide lockout of construction workers this summer, followed by a brief period in which members of the International Association of Bridge, Structural and Ornamental Iron Workers refused to work. The delay forced a construction halt on the pool to allow completion of the centennial wing in time for the many activities scheduled for September. Councillor William Cudmore, a council representative on the Recreation Committee, told a group of Ward 2 ratepayers Tuesday he expects the pool to be completed by February.